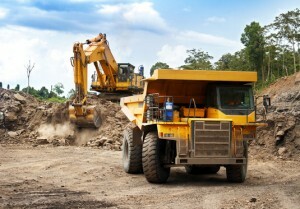 Heavy machinery and large construction vehicles represent a unique challenge for the fire protection industry. These vehicles are often found on a variety of surface terrain, and away from power and water supply sources for a portion of time. However, they also are in use for long hours each day, utilize flammable liquids combined with a high heat power source. This combination demands that a fire suppression system be readily available in the event of an emergency. A vehicle fire suppressant agent is typically a wet chemical agent that uses organic and inorganic salts along with surface-active ingredients to reduce the surface tension of the flammable liquid and cool the fire. It has both fire suppression and cooling abilities, blankets the fuel component of the fire and removes the oxygen. This helps to prevent any reflash.